old pics 165, originally uploaded by Mic2006. 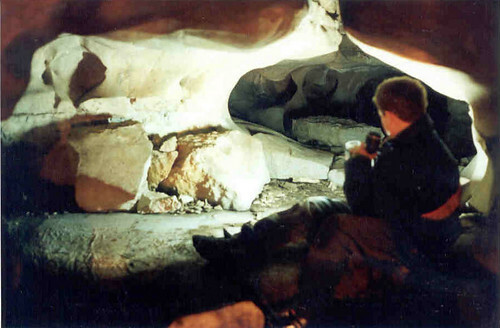 Another picture of Dewdneys cave taken some time ago – as in at least 15 years ago when my son was young – he is holding a portable fluorescent light in front of him and I had taken the picture with slow exposure using an old SLR. In following upstream from the triangular entry shaft there is this section off to the right where these pheratic – bedding plane oriented tunnels lead off into a maze. Nobody seems to really know the full extent of the system but Marcus B. has the best idea as I am told he has a pretty extensive map. I recall a trip that I had taken some years ago with Lori Nichols and Rob Laidlaw, Lori described some long straight, extremely tubular white tunnels that her group found off in this direction. Anyway my good caving partner seems to be making a slow recovery and we will probably be heading out tomorrow for a little exploration in this area that we feel is quite promising.